Health@world: an international, interactive health week, meeting people with common interests! Within the international project health@world, first year Nursing students of Howest (University of Applied Sciences) learn about the importance of social and cultural influences on nursing, health and health care and open their minds to the diversity of our (globalizing) society. The project is organized as an international week and the Nursing Department of Howest invites international nurse students and lecturers to participate. With an evidence- and experience-based approach, participants learn with and from each other about cultural sensitive care and health promotion worldwide. Many combined factors affect the health of individuals. Health is determined by their circumstances (health behavior, genetics,…) and environment. To a large extent, factors on international (economic inequality north-south, financial crisis,…), national (debts, economic measures,…), community (environment, employment,…) and family (income, housing,…) level all have considerable impacts on health. All determinants mentioned above are presented to the first year students as a framework to be able to understand differences in health, health care and health behavior of different nationalities and cultures. Evidence based nursing is becoming common practice in health care settings. Still there are a lot of differences between the nursing practice in different countries worldwide and even in Europe. Is nursing practice also culturally determined? Both students and lecturers who’re participating in international exchange are reporting a lot of differences in nursing procedures, materials and practice between countries. Even within a country, nursing practice can already differ between health care settings (e.g. hospital versus home care). An important cause of these differences is definitely the environmental reality in which nursing is practiced, but maybe also different evidence and therefore different nursing education. Maybe we can even speak about a different ‘nursing culture’. In a relatively short time, Belgium has become a multicultural and multireligious society. On the one hand that’s positive. A multicolored society has many advantages and can be very enriching. We are invited to deal with the richness of difference and meet the other. On the other hand this colorful life doesn’t come without a struggle. Regularly there’re frictions, conflicts and disagreements related to the ethno-cultural diversity. This social trend is also reflected within the healthcare services. Also healthcare facilities are challenged to intercultural work. And also here this happens somewhere on the continuum between “very inspiring” and “especially difficult”. The challenges in this field are wide and complex. More than ever there is a need for intercultural dialogue, to grasp and understand the actual intercultural processes and to find an appropriate attitude to deal with that. As a future nurse it’s important to look at your own place within a more global and evolving context both national and international. Through this international week, students learn to know the importance of social and cultural influences on health and health care and open their minds to the diversity of our society. During this international week students will learn about the differences in healthcare in the world and the influence of Europe and the world on healthcare in their home country, mainly in the area of cultural sensitive care and health promotion. Students will also learn to be sensitive for other cultures they meet in health care settings and learn how it influences the daily practice as a nurse. Mixed teams will be assembled, in order to work on intercultural cases. For lecturers (and other invited guests) who will attend the health@world week, it will be an opportunity to share some ideas and to have discussions about further cooperation (see below, practical information). During the health@world week, students will work on intercultural cases in mixed teams. The teams will be guided by the invited lecturers. It will be an added value to share your opinions and evidence-based (and/or experience based) approach on how to solve the intercultural case. 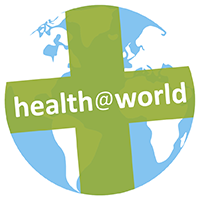 Since the academic year of 2015-2016, the health@world international week is embedded in the Howest International Partner Days with meetings, workshops and networking activities. In 2018, the Howest International Partner Day will take place on Wednesday 25th April 2018. There are several accommodation facilities in the area of the campus. We propose the IBIS budget hotel, a new and cheap hotel situated next to the main entrance of the railway station of Bruges. Then you’re near to our campus and also near to the city center. Guest lecturers are warmly welcome to teach in the international week. 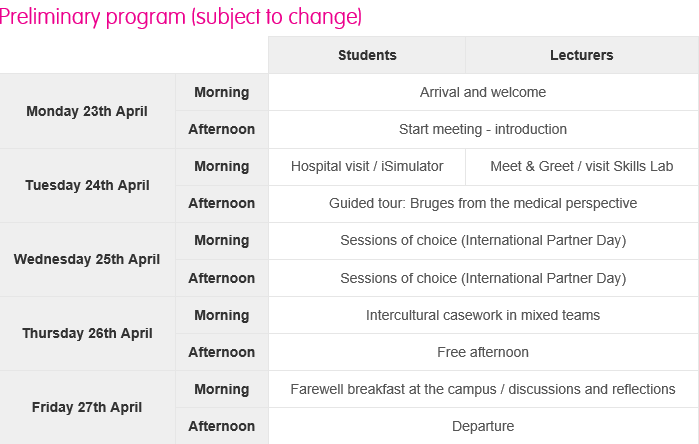 The visit can be organized as an Erasmus teacher exchange. We also ask the invited lecturer to introduce the presentation with a brief summary of the health care system and the nurse education in the own country. The overall aim is to compare evidence, practice and education resulting in an article or shared course material that can be used by the participating lecturers for publication.